I've been a fairly outspoken opponent of Brad Ausmus and his idea of "baseball strategy" for quite some time. When things came to a head near the end of the 2015 season and a rumor leaked that Ausmus was getting fired, I was actually glad. That's a pretty weak word, let me try again: I was thrilled. I didn't even have to think about it, I felt that feeling right away. And when it was announced that the organization was bringing Ausmus back for 2016 after all, I went on a blackout bender so impressive that even Hunter S. Thompson called to express his concern. However, I said at the start of 2016 that I would be fair with Ausmus. I'm not just going to criticize him, I'm going to acknowledge it when he makes the right moves. It's healthy, you know, to keep some kind of balance in your life. And to be honest, Ausmus has made several pleasantly surprising strategical moves in the first two weeks of the season. He's made a few bone-headed moves too, but so far, the good ones outnumber the bad ones. Let's take a look at some of those tactical decisions and rate them on a scale of either "grinning Miggys" or "annoyed Miggys." Opening Day, Tigers vs Marlins, K-Rod blows the lead in the ninth inning, the game goes into extra innings -- you remember all that. Drew VerHagen pitched the tenth, and in the top of the eleventh inning, with the Tigers batting, Ausmus had Shane Greene up and warming in the pen. The Tigers took the lead, and I very much expected Ausmus to sit Greene down and use Buck Farmer, Kyle Ryan, or Logan Kensing instead. Why use a multi-innings pitcher instead of a one-inning pitcher when you've got the lead? That's exactly the "Brad Logic" we've heard before. Remember 2015, why he said he used Neftali Feliz instead of Alex Wilson to protect an 8-6 lead in the eighth inning? He said Wilson is a multi-innings pitcher, so "if we go extra innings I gotta have him available." He seems to have learned his lesson there, because he went with Shane Greene in the eleventh inning anyway, and naturally, Greene pitched a perfect inning. Surprise move by Ausmus! It works to perfection! I'll give that four out of five grinning Miggys. Same game, same eleventh inning. This is how the Tigers scored the go-ahead (and eventual winning) run: Anthony Gose drew a walk -- go ahead, take your time recovering from hearing that information -- and Drew VerHagen's spot in the lineup was up next. Ausmus wanted to bunt Gose over to second base and get that go-ahead run into scoring position, so he brought up Mike Aviles to get the job done. Aviles executed, got Gose over to second base, and Ian Kinsler drove the run in with a single. Again, everything played out perfectly, exactly as Ausmus drew it up. We've got two decisions to rate here. First, the decision to bunt Gose over to second. That's an easy one, actually, because this is the one scenario where bunting actually makes sense. Earl Weaver (who HATED bunting) once said that you bunt when you're prepared to deal with only scoring one run, such as when you're trying to tie the game or break a tie game in late innings. Good call on the bunt by Brad Ausmus, that gets three out of five grinning Miggys. Second, why use Mike Aviles off the bench there when your pitcher is coming to bat anyway? Why not just let your pitcher to the bunting, since that's about all they can do at the plate anyway? Why burn a position player? Because you want that bunt to work. You want a guy who's bunted before. Drew VerHagen has literally never even had a major league plate appearance, so asking him to be responsible for laying down the critical bunt there would have been foolish. Another three grinning Miggys. It only took four games into the season before people started criticizing Ausmus's lineup card. The day before, Nick Castellanos had gone 4-for-4 with singles and a run scored. His reward? The bench, because Mike Aviles got the start at third base instead. Some people believe in the "hot bat" theory, and these are the same people who see someone win a thousand dollars on a slot machine and then immediately want to use that machine themselves, because it's a "hot" machine. This was basically the complaint about keeping Castellanos out of the lineup. He's clearly got a "hot bat" right now, why not get the most out of him before that bat goes cold? Maybe because Mike Pelfrey was pitching, and as a ground ball pitcher, he'd benefit from Aviles's slightly (and I do mean slightly) better defense? Or maybe because C.C. Sabathia was pitching, and in 25 plate appearances headed into that game, Aviles was slashing .360/.360/.440 against Sabathia? Nope. Ausmus's reason was pretty straightforward: Aviles is a bench player, and you can't expect your bench players to come in late and do great things if you've not been keeping them sharp by getting them regular plate appearances. He's right. This is sound thinking. And four games into the season, who cares? You've got plenty of power elsewhere in that lineup, if swapping in Aviles for Castellanos is going to make or break the offense, there's a bigger problem. This gets a solid four grinning Miggys for just being plain old common sense. April 12, Tigers vs Pirates, the Tigers lead 2-0 in the second inning. Anthony Gose singled, Jose Iglesias lined out, and Ian Kinsler walked, so with Justin Upton coming to the plate with runners at first and second, only one out, Brad Ausmus called for a double steal. Gose got thrown out at third, and then the murderer's row of Upton, Cabrera, and V. Martinez proceeded to smack three base hits in a row. 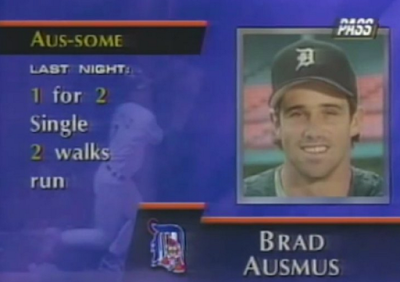 It was an extremely unnecessary move that cost the Tigers a run, and it's not the first time Ausmus has been run over by this strategy. When you've got Upton, Cabrera, Martinez, and Martinez coming up, there's really no need to risk stealing a base. The same thing happened in Boston in 2015 when Ausmus called for a double steal with Victor Martinez at the plate, and Ian Kinsler got thrown out to end the inning. Stop it, Brad. This team isn't even good enough at baserunning basics yet, let alone #YOLO strategies like double-stealing with a slugger at the plate. Three annoyed Miggys. I know it's ingrained in every old-school manager's head, but matching up a lefty pitcher against a lefty batter (or righty vs righty, for that matter) doesn't always get the best results. Some right-handed pitchers are actually better against left-handed batters, and some left-handed pitchers are tougher on right-handed batters. Justin Wilson fits this category. In fact, Justin Wilson is actually harder on right-handed hitters than Mark Lowe. Yes, I'm aware that I'm picking nits here, and yes, I'm aware that the difference between a .596 OPS and a .635 OPS is only 39 points, which isn't even enough to buy something off the dollar menu at McDonald's. But I'm going to pick the nits anyway. Justin Wilson had just dominated the Pirates in the seventh inning of their April 13 game, striking out two batters, one from each side of the plate. He was on the mound to pitch the eighth as well, until the Pirates sent up a right-handed pinch-hitter, at which point Ausmus reverted back to "gotta play the matchups hurr durr hurr hurr" mentality, and brought in Mark Lowe. The results don't really matter, it was a stupid decision regardless. (Lowe walked the pinch-hitter, who later came around to score.) And it's not so much about the 39 points of OPS as it is the archaic mentality of being a slave to matchups when the numbers tell a different story. No, that's it. Those are all the reasons. Giving the hitter an edge is always at least questionable, but it's flat-out chuckle-headed to do it BECUZ OLD-SKOOL BASEBALL RAWR GUM LEATHER TOBACCO SCREW YOU NERDS. This gets four annoyed Miggys. Brad Aumus might actually be adapting and learning from some past mistakes. He used Justin Wilson in the eighth inning on April 8, and then he used Wilson in the sixth inning on April 12. That alone is huge, because it shows that Ausmus hasn't wedged himself into an immovable "Justin Wilson is my seventh inning guy" position this year, at least, not yet. I'm going to call it a "win" that even the questionable moves Ausmus has made this season haven't been super barn-burners. That's progress. Keep it up, Brad, you might just prove me wrong after all.